Here are some great tips we found to keep you Concealed Carry Fans out of Trouble. Surprised? We are, too. Every single year people carry concealed into New Jersey. Whether it’s on purpose or accidental, it doesn’t matter. The State of New Jersey doesn’t care the reasons – it’s a felony. Until that changes, avoid crossing that state border at all costs while carrying a firearm on your person. *Go ahead and add: Maryland. Lots of people get arrested in Maryland for accidentally crossing over with a legally registered firearm. Some states allow concealed carriers to enter into alcohol serving establishments. Almost no state allows a concealed carrier to drink while armed. In general, there’s nothing wrong with going into a restaurant that happens to have a bar. But establishments that only serve alcohol – it’s just a matter of time before someone does something they’d normally regret. You don’t need to be that person. Let the bouncers, the bartenders, and the police deal with it. Some concealed carriers don’t see the harm in having a few oat sodas (or bourbon pops) while at a gathering of family and friends. After all – we’re all close, right? The only problem is that if you’ve got your favorite everyday carry strapped to your hip and you’re under the influence – you’re not thinking clearly. Even if Chechen terrorists parachute down from the sky into the middle of your family gathering, if you’ve been drinking – you’re not going to be any good at fighting them off. It generated a heated debate, but we stand by our thoughts on the topic of not drinking while carrying. You know the type. One word leads to another and before long, that friend of yours has got him or herself stuck up the proverbial creek without a paddle. Sometimes this just ends with a minor verbal altercation or perhaps a shoulder shrug on behalf of the other person dealing with your friend. Other times, there’s the potential that friend of yours is going to wind up in trouble. And as much as you want to help him or her – going in armed is probably not a good idea. If you plan on being armed, avoid friends that can get you drawn into any unnecessary confrontation. 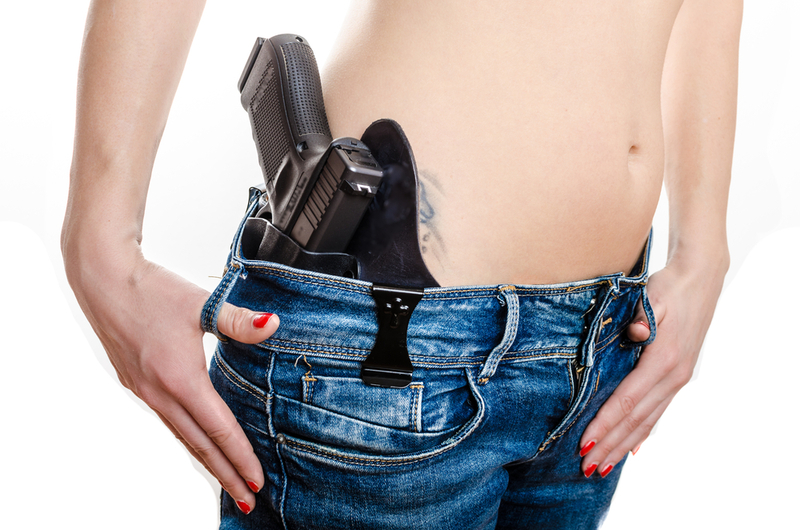 A concealed carry firearm is that – concealed. Just like your body, there are pieces of you that are appropriate to adjust in front of other people and then there are other parts that aren’t. Your firearm is one of those other parts now. If you’re in line at the checkout – don’t worry, your firearm is still there. It can be nerve-racking, at first, to carry everyday with a round in the chamber. Your firearm isn’t going to discharge unless you pull the trigger. How do you know that? Because you place your firearm in a high-retention holster that ensures the trigger guard is secure. Now, you are in control. Some people are just more prone to violent outbursts than others. We know where those people generally hang out. Sure, they can wander outside of their usual spots and there’s no guarantee you won’t run into them at the store. Still, stay out of places that tend to have lots of angry people looking for fights. If you’re a concealed carrier, you’re expected to act as a law-abiding citizen. You’re an unwitting ambassador of the community. If you’re carrying concealed on your motorcycle, and you decide to whip in and out of traffic just because you can – you can safely assume nobody likes you. That’s a pretty big statement. But when you’re parked in your car in a tremendous traffic jam and you see a motorcyclists weave and bob between vehicles, you’d probably wish they wouldn’t. Now, if you’re doing it, and you have a firearm strapped to you – you’re inviting misery. Every single warm-blooded mammal in this country steps outside the law. Whether it’s running a “Stop” sign or going faster than the posted speed limit – if you’re going to step outside the law, do it without a firearm. Let’s continue this point a bit further. We covered a story a little while back where a concealed carrier was driving like an idiot in Florida. I know, I know – you can hardly believe it. A Floridian driving horribly. But suspending your disbelief just a moment, this driver happened to accrue ANOTHER vehicle following him for allegedly the purposes of getting his license plate number so he could phone it into police. That situation turned out about as bad as you can imagine it would. Concealed carriers don’t like being followed. But going off point #3 and continuing it into this point: if you’re going to drive like an idiot, do yourself a favor and leave your firearm out of it. That gun is not your automatic justification to do whatever you please. Even worse than picking up strangers is picking up strangers who are drunk. Unfortunately, for this one Uber driver, he found out the hard way that it doesn’t pay to use your firearm to secure an unruly, drunk passenger. For those who aren’t taxi cab drivers – avoid the situation if you can. For those who do regularly drive drunk and sometimes unruly strangers about, if you run into this conflict, bring the vehicle to a stop, take the keys out of the ignition, and exit the vehicle with your firearm. We’ll go into this in more detail in a future article.